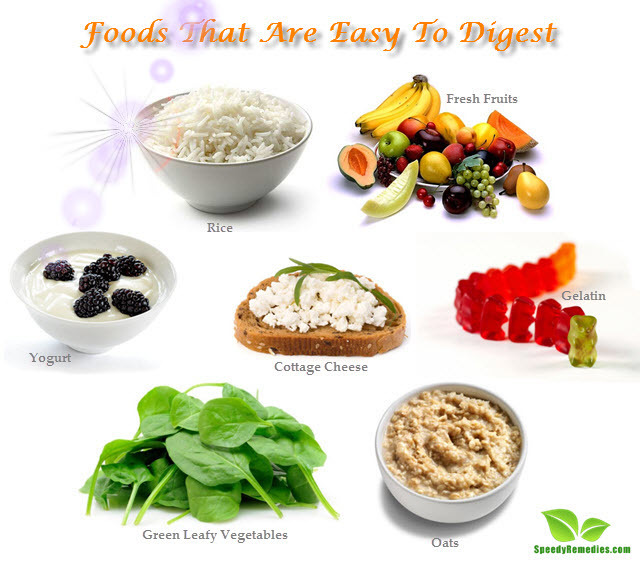 Foods that are high in nutrients but easy on the digestive system eventually help in maintaining the digestive health. You may be looking for these kinds of foods for various reasons based on comfort, choice or health. Nowadays, most people have hectic lifestyles, leaving no time at hand to prepare meals at home. Thus, there is a pattern of increased consumption of junk food in an attempt to find an easier and more convenient way to grab a meal on the go. In such cases, it is important to find healthier alternatives. In addition, factors like having a condition that makes it tough to digest food properly, recovering from an illness or surgery, or simply intending to give the digestive system a break from all the heavy meals encourage the search for nutritious yet easily digestible foods. Fatty or complex foods should be avoided, along with those that may be spicy, oily or have large quantities of sugar. Coffee, tea and other drinks that may contain caffeine are also best eliminated if you are looking for an uncomplicated diet plan as far as digestion is concerned. Foods you would be looking for would be with few spices and as simple as possible. Portion size is another thing to be kept in mind; it may be better to have 4-6 small meals rather than 3 large ones. Fresh fruits are always good for you, they are filling and nutritious, no preservatives, no extra, unhealthy fats while being refreshing and light on the stomach. Bananas are considered the best in this category as they have enzymes that are good for the digestive tract. Plus, they are rich in potassium which is required for a general state of good health. Others in the list are – apples, papaya, melons, oranges, etc. Green leafy vegetables help clear out the digestive tract, as they are rich in fiber. They are filled with nutrients, vitamins and minerals which are important for the proper functioning of the body. Moreover, as with fruits they require almost no preparation time before they can be consumed. Vegetables like cabbage, lettuce, etc. are good examples in this regard. Yogurt is said to have good bacteria that help fight the bad bacteria that may be present in the stomach and hinder proper digestion. So, if you are looking for foods that help ease your digestive problems and provide ample nutrition, yogurt is the answer. Furthermore, this food item is rich in calcium and protein. Oats are another rich source of fiber, which also helps in easing constipation. Like bananas, oats are also made up of complex carbohydrates, meaning that they provide slow and steady release of energy. According to the European Journal of Clinical Nutrition, a research conducted in the University of Sydney, Australia, showed that oatmeal was rated number 1 as a breakfast food, and number 3 in a total of 38 food items when it came to making the people involved feel full and satisfied. Rice may, as well be one of the easiest foods to digest as it is made up of simple carbohydrates; the grains present in rice further help the body digest other foods that may be consumed. It can be had with yogurt or lentils, to make a meal that is rich in protein as well. Rice is an instant energy provider, low in fats, cholesterol and sodium. It has resistant starch which helps in the growth of good bacteria in the stomach. Gelatin is not only easy to digest but it also aids in digestion by easily binding with water to help food move smoothly through the digestive tract. At the same time it improves the health of your nails, hair, skin and joints. This variety of cheese is very nutritious and one of the healthiest choices in cheese. It is rich in calcium, protein and low in fats, calories and carbohydrates. Like yogurt, this too, can be had with rice, or with fruits, some seasoning; as a meal or as a snack. There are other food items that provide for easy digestion viz. ; vegetable soup, mashed potatoes, scrambled eggs, chicken, toast or saltine crackers. It may be suggested that raw vegetables and fruits can be stewed before consumption, however overcooking should be avoided. For the overall good health of the digestive system, overeating, and consumption of large amounts of junk food, or food filled with sugar or oil should be avoided, it will also be helpful to drink plenty of fluids and maintain a healthy body weight.